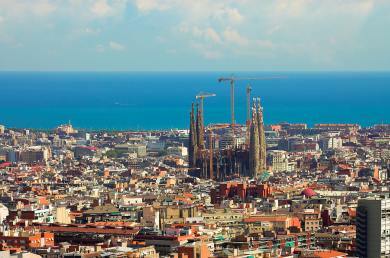 Barcelona began as a Roman colony in the 2nd century and is the capital of Catalonia. Located right on the northeast coast, it is also the second largest city in Spain after Madrid. Because of its wealth of history and culture it has become one of the most popular cities in the world to visit. Its Gothic centre, Barri Gotic, is almost completely intact with medieval buildings dating back to the 14th and 15th century. Centred around the Plaça de Sant Jaume square there is a busy market held each week. Just southwest of this district is La Rambla boulevard, a tree-lined pedestrian zone packed with everything from street entertainers to a bird market. The Mercat de la Boqueria is one of the original markets that dates back to the early 13th century and is also held on La Rambla. This is also where you will find Barcelona’s Opera house, the Gran Teatre del Liceu. However, if you continue to the far end of the boulevard you will eventually come across quite a sharp contrast in the form of strip clubs and bars. La Rambla finishes at the Monument to Columbus which looks out onto the harbour. Of course everyone knows about Barcelona’s famous unfinished Cathedral, La Sagrada Familia, designed by Antoni Gaudí. Its magnificent spires are truly breathtaking. Gaudí unfortunately died in 1026 before his masterpiece was completed and sadly it has been plagued with controversy regarding its construction ever since. However, the south western facade has now been completed with a further four towers. Another Gaudí masterpiece is La Pedrera, an apartment and office block combined which was built in the early 1900’s. Its uneven grey stone facade ripples around the street corner creating a wave effect and has giant multicoloured chimney pots on top. During the summer months the roof is lit up and the building is open to the public for spectacular views of the city. You are spoiled for choice in this city when it comes to museums and galleries. There is the Miro Foundation which was a gift to the city from the artist Joan Miro and exhibits the most exciting contemporary art. The Museu Picasso shows a lot of his earlier work and is located on Carrer Montcada, the street where you will also find Barcelona’s most elegant medieval palaces. The Gaudí Casa-Museu was where Gaudi and his niece lived during the early 1900’s and is filled with furniture designed by the architect, as well as drawings and portraits. There is also the Barbier-Mueller Museum which is the only one in Europe devoted entirely to Pre-Columbian Art and is housed in a gothic palace. With many hills to form a backdrop around Barcelona, the Tibidabo is the highest and is also where you will find the Parc d'Atraccions. Ideal for those travelling with children there is a fantastic array of amusement rides including a giant ferris wheel. The entire park has fabulous panoramic views of the city and the ocean. There is even a glass lift that takes you up to the observation area of the Torre de Collserola telecommunications tower. Looming above Tibidabo's funicular station is the Temple of the Sacred Heart Expiatorio which is basically a church built on top of a crypt and looks almost like two churches piled on top of each other. If you wish to combine your days in the city with tranquil surroundings in the evenings, then a wonderful base would the Parador Hotel Vic-Sau. A former Catalan farmhouse it has now been converted into a luxury Parador with colonnaded balconies and a magnificent swimming pool. With the Guillerias mountains acting as a beautiful backdrop and so many interesting places to explore in and around Vic Sau you could not ask for more. In the town of Vic Sau itself there is the Sant Pere Cathedral and a Roman temple that are well worth a visit. If you are there in December you will get a chance to enjoy the town’s medieval market. 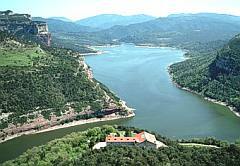 Set in the mountains is the Sau dam and volcanic area of La Garrotxa where there is hiking, horseback riding or mountain biking. With the allure of such an exciting city as Barcelona and the relaxing surroundings of Vic Sau you will be able to enjoy the best of both worlds and regular flights from all major UK airports has certainly made flying into Barcelona reasonably inexpensive and very straightforward.